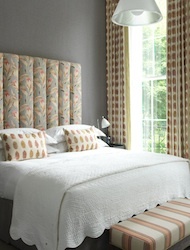 The London 2012 Olympics, which has brought more than 14,000 athletes from 204 countries and close to a million spectators to this historic-meets-modern city on the River Thames, has also inspired the opening of a host of exciting new upscale hotels – with splashy interior design worthy of a gold, silver, or bronze. In case watching the Olympic Games (which run through August 12th) is inspiring you to plan a hop across the pond to London in the coming weeks or months, here’s a look at six of the city’s most notable and stylish new places to stay, a few with appealing opening rates extended through fall. 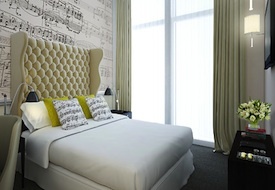 Colorful and charming, The Ampersand Hotel , a new boutique property opening in Kensington in late August, offers a great location and whimsical decor in 111 rooms and suites. Filled with vibrant prints and patterns inspired by the Victorian era (the building dates to 1888 and the V&A Museum is nearby) it’s been given a modern twist by playing them against a backdrop of modern neutrals. The lobby lounge is bird themed and there’s a patisserie on premises to sate your sweet tooth. Room rates start at $195/night. 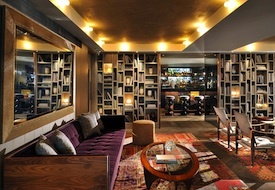 U.S.-based Thompson Hotels has extended its reach across the Atlantic with the March 2012 opening of Belgraves, a contemporary, 85-room boutique property in the atmospheric and central residential neighborhood of Belgravia. 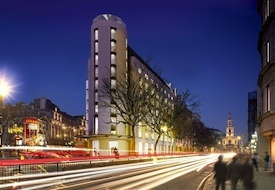 The hotel has a great location (it’s just a short walk to Sloan Square, Harrods, and Hyde Park); bold Bohemian-sleek interior design by the U.K.'s Tara Bernerd; the HIX Belgarvia restaurant and Mark’s Bar by British chef, restaurateur, and cookbook author Mark Hix; and a chic rooftop terrace. Room rates start at $395/night. Just opened in June, Dorset Square Hotel is an elegant townhouse offering 38 individually designed rooms and suites newly refurbished by Tim and Kit Kemp, the husband and wife team behind Firmdale Hotels. Located on a leafy block in Marylebone, the hotel features Kit's signature design stamp: bold colors, contrasting fabrics, and one-off art pieces and furnishings. Its Potting Shed restaurant serves English brasserie-style fare for breakfast, lunch, and dinner, as well as afternoon tea. Room rates start at $305/night. Nightlife-lovers (think pulsating music-filled lounges and a see-and-be-seen rooftop) have a new place to gather since ME London, a 157-room Foster + Partners-designed property, opened in May on The Strand. The rooms are equally cutting-edge, featuring white leather walls and floor-to-ceiling windows with views of the London Eye, Trafalgar Square, and more, while the 10th-floor rooftop Radio bar offers sweeping views and even a few fire pits. You can also indulge at the futuristic Marconi Bar in the lobby, or STK, a steak restaurant. Room rates start at $460/night. 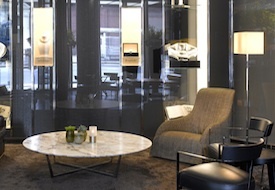 Sophisticated marble and sleek silver blend in a monochromatic homage to timeless glamor at the ultra-exclusive Bulgari Hotel London. Opened in June, it is the third property for the Italian luxury jewelry company (joining those in Milan and Bali) and its locale overlooking Hyde Park in fashionable Knightsbridge (one of the city’s top shopping and dining neighborhoods) is fitting. The 85 rooms and suites are London’s largest and feature Marquina marble and white glass bathrooms and custom silk drapes inspired by a 19th-century silver brooch by Sotirio Bulgari. Room rates start at $800/night. Slated to open in October, Hotel Café Royal occupies a landmark 150-year-old building (which until 2008 housed the famed eatery Café Royal) on Regent Street in Piccadilly Circus and will offer 159 rooms and suites designed with bold 21st-century aesthetics contrasted against 1860s and 1920s architecture. It will also house an Akasha Holistic Wellbeing Centre with a pool, gym, and yoga studios, as well as Café Royal’s famous Grill Room and Domino Rooms, to be reinvented by one of London’s leading chefs. Room rates are expected to start at $700/night. See our London destination guide for more trip-planning information, then use our Travel Search price comparison tool to find the lowest rate on flights, hotels, cruises, and more travel deals.